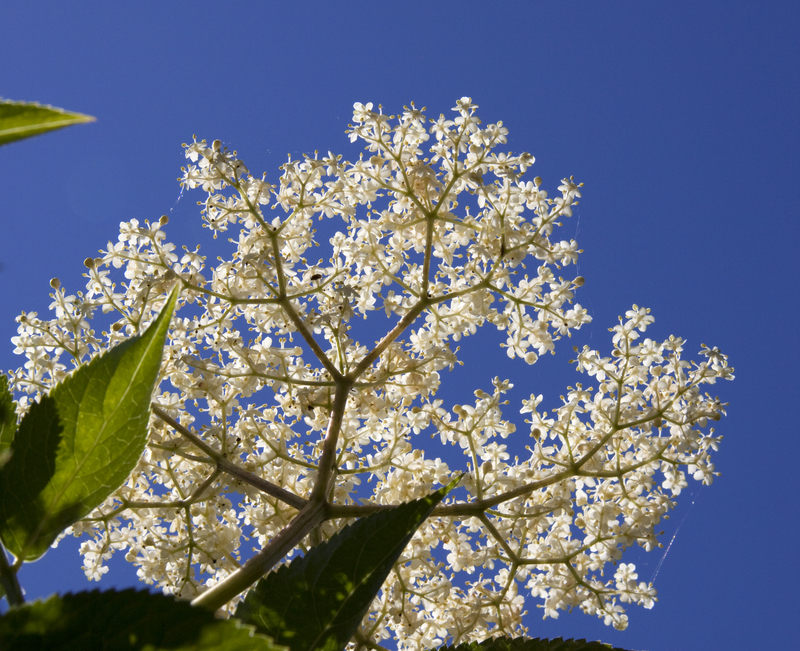 It’s the 30th of June – a beaut warm sunny day, so we go for a walk away from the roads and collect 60 elderflower heads. When we get home we deflower them – a slightly tedious process using fingers and forks, but it considered best to minimise the amount of “stem” in the mix. 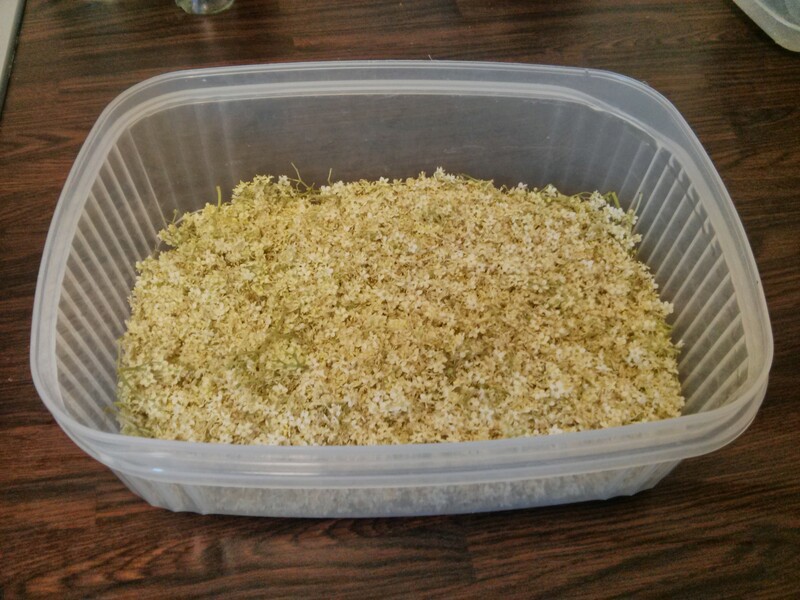 We achieve a yield of about 165g of flowers from our 60 umbels. The flowers are placed in a clean plastic container, 2 litres of boiling water is poured over, and a tablespoon of lemon juice added to reduce discolouration. This mix is covered, left to cool, then popped into the fridge for 4 days to steep. 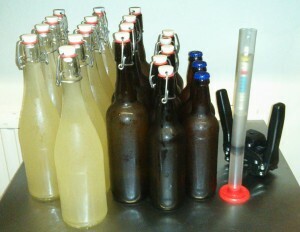 In the early AM: Make 1 litre of 1040 yeast starter using 105g of cane sugar and add a vial of Saison II from White Labs. I picked this yeast for two reasons: first is it was simply what I had to hand – recently bought for a planned beer brew; second I thought a “funky” yeast would be good to add a bit of extra flavour to something fermented simply from sugar. Decant clear liquid from the yeast starter to sterilised container and cover. Refill the original yeast vial (sterilised) with yeast sediment for later re-use – this is purely so I have some Saison II to culture up for a subsequent beer brew. Rinse the rest of the yeast sediment into the decanted starter liquid. Cover and leave aside to come to to room temperature. When cooled pour the liquid through a sterile sieve into a sterile fermentation bin. I did this from a good height to help introduce some oxygen. Top up to 15 litres with clean, preferably well aerated, water. Wait for temperature to drop to about 20ºC before pitching in yeast. Let this sit in a suitable spot to ferment away, my fermentation happened in a range of about 20ºC to 24ºC. At day 9 I’ve noticed that the gravity hasn’t shifted much over the last two days so it is time for the next stage. I’ve chosen to add a champagne yeast to chow through any remaining sugar to yield a “dry” end product. Create a 1040 gravity yeast starter as per day 3 and into this pitch a sachet of champagne yeast. At this point the mixture has had 6 days fermentation time. Pitch in whole 1 litre champagne yeast starter and take a gravity reading so we can calculate the ABV yielded from the next stage of fermentation. Gravity check, now 1017 so approximately 7.2%. 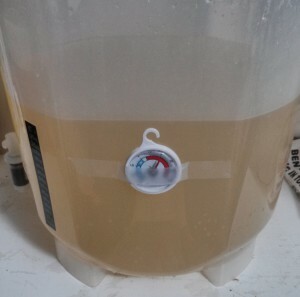 Has gone very cloudy now – hopefully a sign the yeast is still eager, would like this to come out quite dry. The gravity is stable and very low now – it is time to bottle! 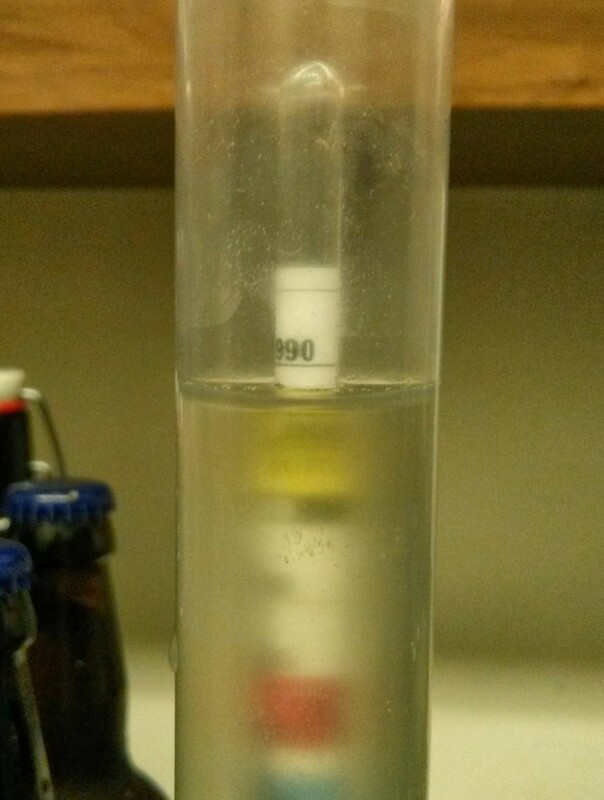 Final Gravity: 0998 – wowzers – beastly yeasties! This means we have about another 5.5% ABV from the champagne stage, giving a strength of approximately 9.7% before bottling. Siphon, or otherwise move, the liquid into another vessel (anything suitable for bottling from, a pressure barrel is what I had handy). The aim is to leave all the trub behind. The de-trubbed liquid is then refrigerated overnight to encourage even more yeast to drop out. Note: weight of the liquid is 15.3kg – assuming approx 1kg = 1 litre this lets me calculate how many bottles to get ready. Colour is a pale straw, almost crystal clear. Constant bubble streams rise through the glass. Yep, distinctively elderflower – not overt, but distinct. There is a saison “farmy” note too – not sure you’d pick it without knowing to expect it. Too much of a “boozy” note, à la sniffing a bottle of meths. First to hit is sensation rather than taste: fizz prickle, lively carbonation. Flavour is perfumed, kind of soapy really. Sharpness akin to a rather astringent Chardonnay. This is backed by a “woody” spice which almost makes up for missing body. Thoughts: it needs less “meths” aroma and maybe rather than less sharpness it needs more body – a source of tannic acid perhaps? Something like that to balance it out. The saison yeast has helped here – I think with just champagne yeast it would have been really harsh on the tongue and nose. 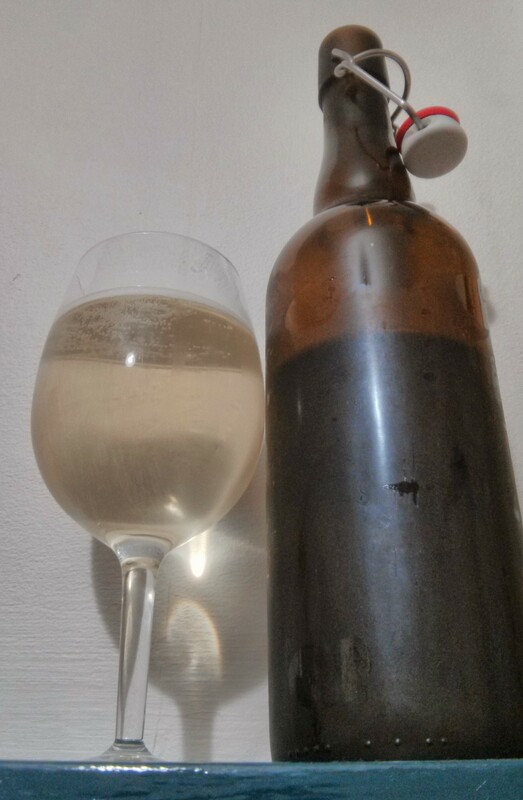 Well – despite some misgivings I consider my first attempt at a “country wine” style of thing to be a success. Next year perhaps a couple of tweaks… cheers! Elderflower Saison Fizz from Yvan Seth on Vimeo.